The library launched its new study room booking system on 30 November. Try it now! You can also find the link on the library homepage (Book a Group Study Room under the heading of Popular Resources). More user friendly and easier to use from your mobile phone. Consistent with library opening hours. Easy to cancel the booking through your confirmation email. Follow these instructions to book a study room. Click one of the links below to select the location of your booking. 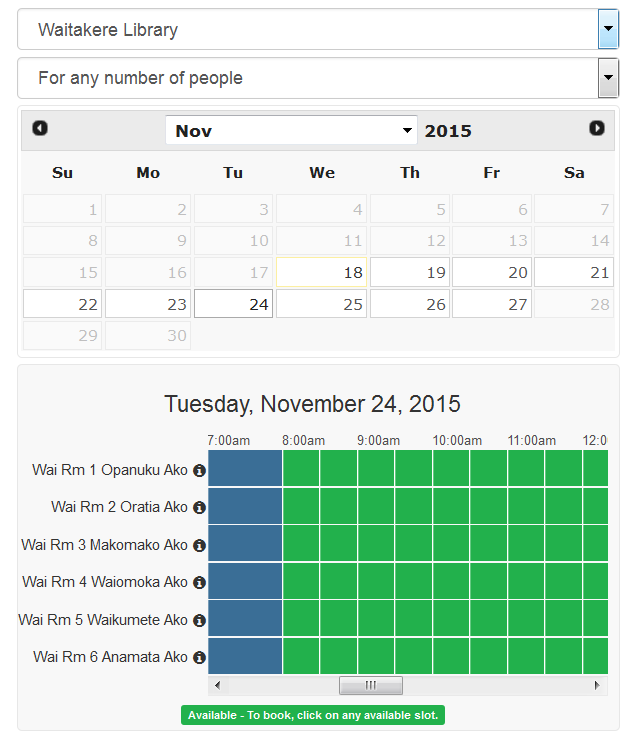 Select the date of your booking using the calendar in the left column. Select green slots in the time table: Green=Available; Yellow=Selected; Red=Occupied. Click "Continue" at the bottom, and then click "Submit Time Slots". Sign in with your full @myunitec.ac.nz email address and your usual Unitec password. For more instructions, check our New Room Booking System Instructions for Students. Monday 30 November – Waitakere and Building 1 libraries closed in the morning and opening at 12.30pm. Wednesday 2 December – Waitakere and Building 1 libraries closed from 12.30 to 2.30pm. Also Northern Campus Library CLOSES for the summer break from 28th November but the Northern Campus Learning Commons will remain open. All other Unitec Libraries will be changing to shorter summer hours from Saturday 28 November. See details on the Library hours web page. A recent survey of the library website and LibrarySearch shows increased task completion (88% compared to 78% in 2014) and satisfaction rates (an average of 7.4 (out of 10) compared to 6.9 in 2014). Comments included that the site was easy to use and had the information and services needed including peer reviewed articles, referencing guides, study room bookings and live help. 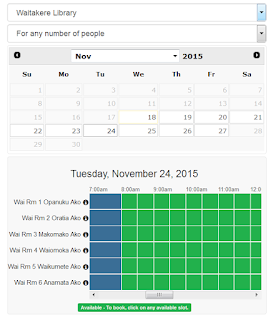 In December, the new booking system is being rolled out across all Unitec libraries. Students and staff will be able to book a study room while sitting in the bus on the way to Unitec as the new system is mobile friendly. Emails of booking confirmations are sent to the Office 365 mail portal. This email includes an attachment which allows you to put the booking into your own Outlook calender, as well as a link to allow you to cancel your booking if necessary. Find the latest update of the new study room booking system. A comprehensive, benchmarked Library-specific ‘Insync’ client survey was completed by over 1200 Unitec Library customers in September 2014. We also ran this survey in 2012 and 2010. It provides rich data and allows us to compare Unitec Library’s performance in supporting students and staff against 40 other, mainly New Zealand and Australian tertiary libraries, including University of Auckland, Monash University, University of Melborne, QUT and University of Sydney. This time Unitec Library recorded an overall score of 81.4%. This places the Library in the first quartile (or top 25%) of libraries that have surveyed with Insync over the last 2 years and represents an overall performance score increase of 0.8% since the last survey in 2012. The survey rates respondents’ perceptions about the importance and the performance of more than 30 factors in the categories of Library staff, Communication, Service delivery, Facilities and equipment, and Information resources. The Library performed highest on the category of Library staff, with a score of 89.9%. Library Staff and Facilities and Equipment both recorded marked improvement since the previous survey. In all five categories the library achieved higher positive results in the ‘aggregated comparison tables’ than 12 other participating libraries, including: Griffith, Monash, QUT, RMIT and the University of Auckland. For example, our ‘positive’ score for Library Staff of almost 90% compares to the aggregated average of 88%. The data collected through the survey gives us insight into the ‘gap’ between importance and performance. Only two statements had gaps which indicated opportunities for improvement. These were: “A computer is available when I need one” and “I can find a quiet place in the library to study when I need to”. Significantly, each of these gaps have decreased since 2012, meaning the work we’ve done to address and alleviate issues has been acknowledged by students and staff. To help address computer availability since the survey we have increased the number of laptops available for loan at the Hub Library and Learning Commons. To help address the need for quiet study space we have included more study areas in our Waitākere and Building 1 library spaces. We are also making study space one of the key requirements of the new Social and Study Hub Building planned to open in mid-2017. Library staff are using the data to prioritise and plan action to continually improve our systems and services. This survey is run every 2 years so we will run it again in mid 2016. For further information, please contact Gail Dallimore. IMS will be making a change to wireless authentication on Thursday 22nd October at 9pm. When connecting to wireless after the change some users may be presented with a certificate warning and/or be prompted for your Unitec login and password. This is expected behaviour and it is safe to accept the certificate warning and re-enter your Unitec login and password if prompted. If you still have problem to access wireless, please contact IMS. Due to a system update on Sunday morning (11th Oct 2015) some library functions may be unavailable for a short time. These functions include placing requests and viewing My Library Account details. According to our suppliers everything should be back up and running before 11am. Please take this into account in your schedule. We apologise for any inconvenience this may cause. The access to ebooks through EBL will be unavailable from 10am to 1pm, Wednesday 16 September. The reason for the outage is that ProQuest is preparing to launch its new Ebook Central service and needs to combine ebrary and EBL contents into a single new back-end system. Please take this outage into account in your schedule. We apologise for any inconvenience this may cause. We recently upgraded our Databases A-Z. Databases A-Z is a tool that you can use to find databases that Unitec Library subscribes to. * These databases have scholarly articles and other information to support your study, teaching and research. Library homepage (listed under Search heading). Subject and study guides (listed as one of subject and study guides). Search databases by keywords, eg. database name or description. Filter the list by Subjects, Database Types and Vendors/Providers. Browse the list by initials (first letter of database name). Share the link of the database. Find the description of a database under its title. As well as being accessible via the A-Z , the databases the Library subscribes to are also linked from the Library Subject Guides. We link the subscription databases from several places as it is important these expensive resources are highly accessible and well used so we can continue to justify paying for them. Each year Unitec library runs a survey to find out how we can improve the library website. The questions cover the purpose of your visit, and whether you were successful in completing this task. We use this information to continually improve the content, navigation and overall experience of using the library website. SAGE Research Methods provides access to 1000+ books, encyclopedias, and journal articles, as well as innovative features, such as the Methods Map visual browse tool using a custom taxonomy of 700+ methods terms. Users can explore methods concepts to help them design research projects, understand particular methods or identify useful new methods. It also helps users conduct their research and write up their findings. 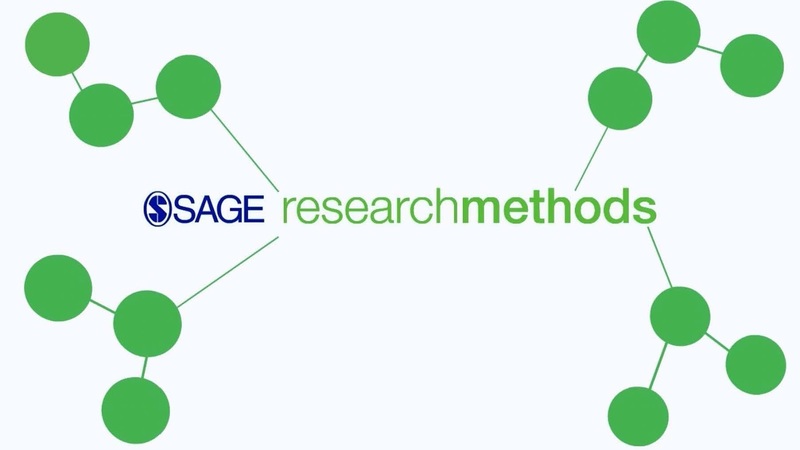 You can access the Sage Research Methods from the Databases A-Z and relevant subject guides via the Library website. Click here to go to the database. The LexisNexis Practical Guidance database is arranged by practice area and provides access to a broad collection of guidance notes, commentary, checklists, precedents, forms, cases and legislation across the topics you need to successfully deal with a legal matter. The available subject areas are Business law, Employment and Resource management. You can access the LexisNexis Practical Guidance from the Databases A-Z and relevant subject guides via the Library website. Click here to go to the database. Unitec staff and students now have full access to a comprehensive collection of online safety training videos via SafetyHub. SafetyHub offers practical, up-to-date guidance on a range of health and safety issues relevant to different workplaces, from the office to workshop. The platform covers behavioural safety such as ‘workplace security and violence awareness’ or ‘drugs and alcohol at work’ through to safe handling of power tools, vehicles and hazardous chemicals. You can access SafetyHub from the Databases A-Z and relevant subject guides (eg the Building Technology/Trades Subject Guide) via our website. Click here to go to SafetyHub.